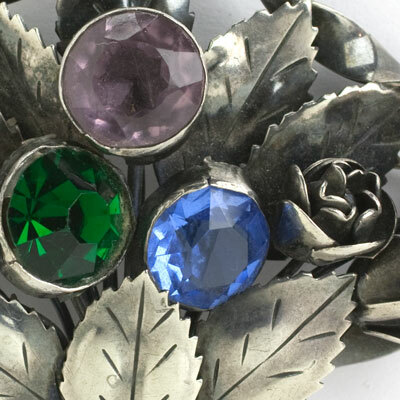 This collection of 1940s jewelry includes ear clips, necklaces, double-clip brooches, bracelets, and brooches in bold Retro Modern and delicate Victorian motifs. 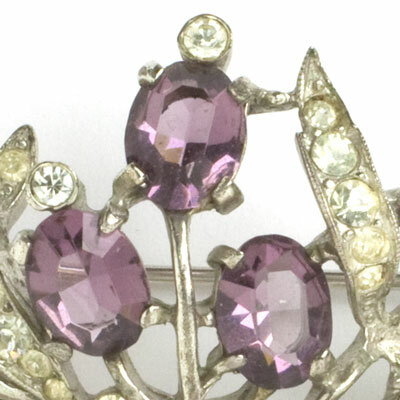 Because women’s clothing during the war years was austere and masculine, jewelry became very feminine. Stylized flowers and animals as well as buckles, bows, ribbons and fabric-like folds were popular. Bracelets were wide and often worn over gloves. 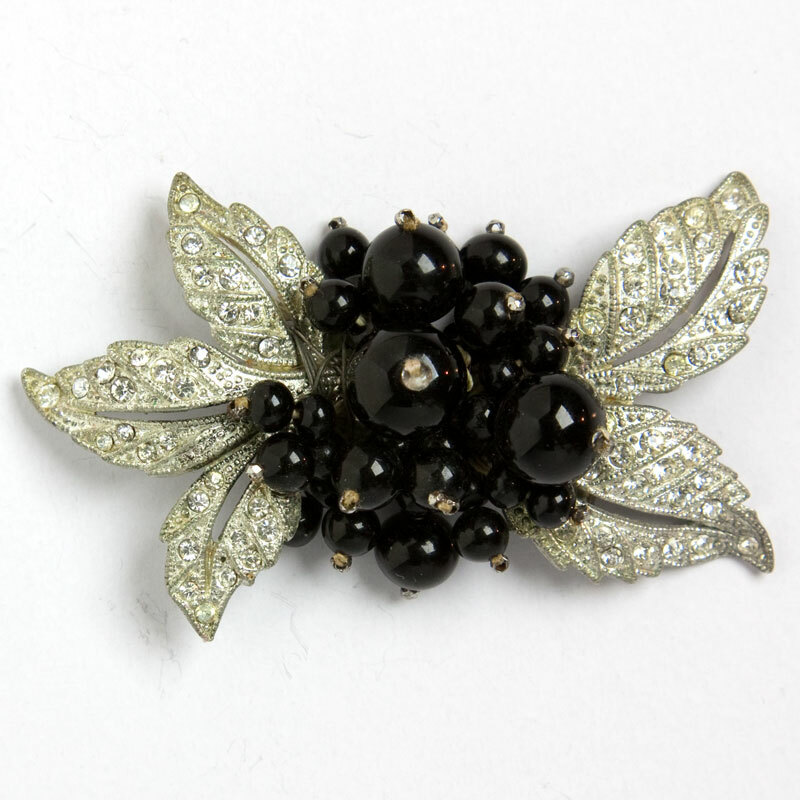 Big and bold brooches were worn on the shoulder of day and evening attire. 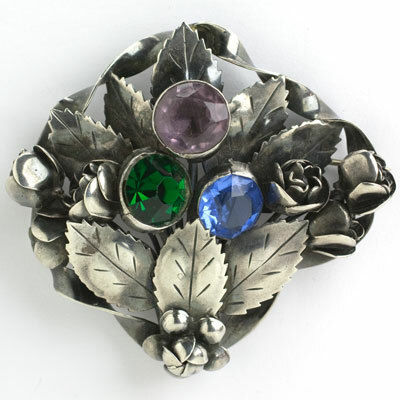 Double-clip brooches, still enormously popular, evolved from geometric pieces into asymmetrical, three-dimensional images. White base metals were replaced with sterling silver, often with yellow-, pink-, green-, and/or rose-gold plating. Read more about 1940s jewelry and fashion. 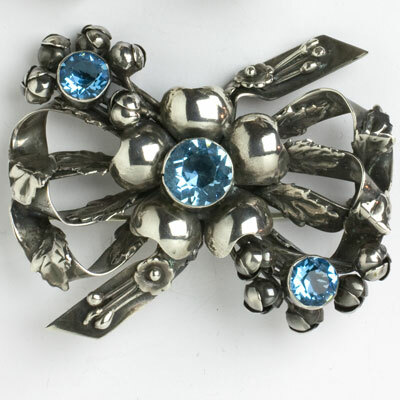 A sterling silver four-loop bow forms the foundation of the brooch in this 1940s set by Hobé. Each loop is embellished with layers of leaves and buds. The focal point is the flower that sits on top of the bow. Its aquamarine center forms a vertical line with two additional round aquamarine-glass stones that adorn the piece. Each ear clip is a flower with aquamarine center, topped with two vertical, textured leaves. The pin closes with a roll-over safety clasp. This set looks great with Hobé's Aquamarine & Sterling Flower Bracelet – scroll down to see it. 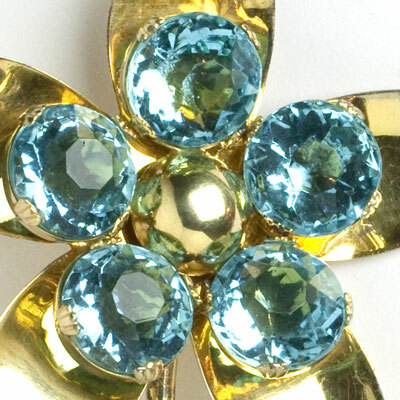 A flower with an aquamarine-glass-stone center sits atop the four-looped bow foundation of this 1940s Hobé brooch. The ribbons are adorned with layers of buds and leaves. 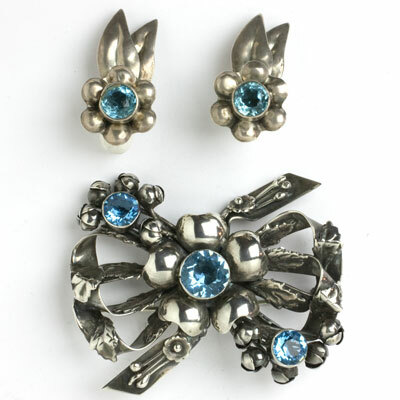 An aquamarine-glass stone is at the center of each bow-shaped ear clip. The detail on these sterling silver pieces is a superb example of the maker's craftsmanship. The pin closes with a roll-over safety clasp. 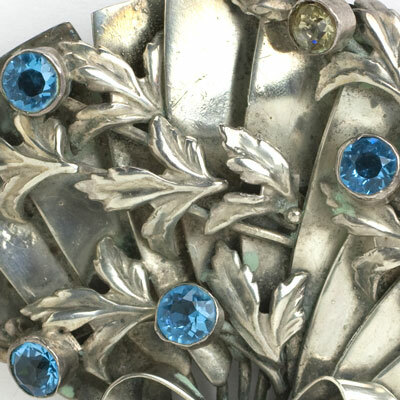 The same floral motif is used in Hobé's Aquamarine & Sterling Flower Bracelet – scroll down to see it. 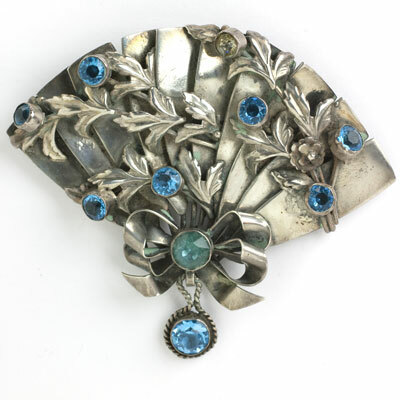 This 1940s large sterling silver fan-shaped brooch is another beautiful Hobé design. It is layered and ornately-detailed with leaves and bezel-set aquamarine-glass stones. At the base sits a ribbon tied with a four-looped bow and aquamarine center. It suspends a twisted-rope pendant accented with another aquamarine. One stone at the top is clear, but it does appear to be original. 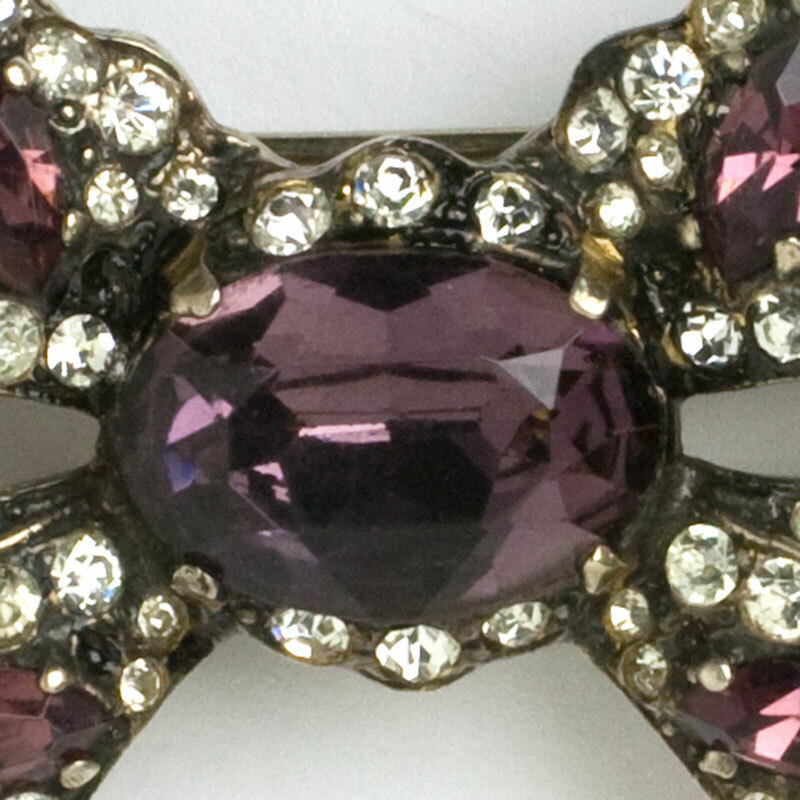 This brooch, which closes with a roll-over safety clasp, is a great example of the genius of this maker. Scroll down to see a bracelet that coordinates beautifully with this piece. 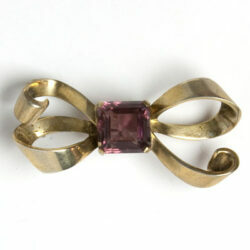 This large 1940s gold-washed sterling silver Retro Modern brooch is bold and beautiful. 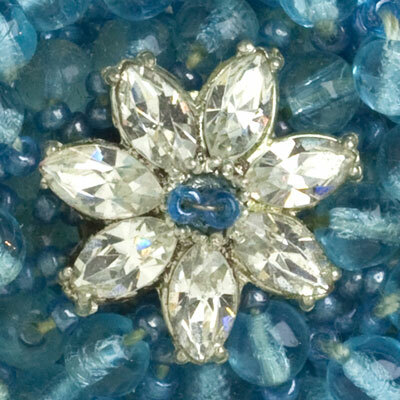 It features a faceted, round aquamarine-glass stone set on each of the flower's five petals. This tall (4-inch) piece was made by Hess-Appel under their Jollé trademark without the accent (which was used only in their advertisements). 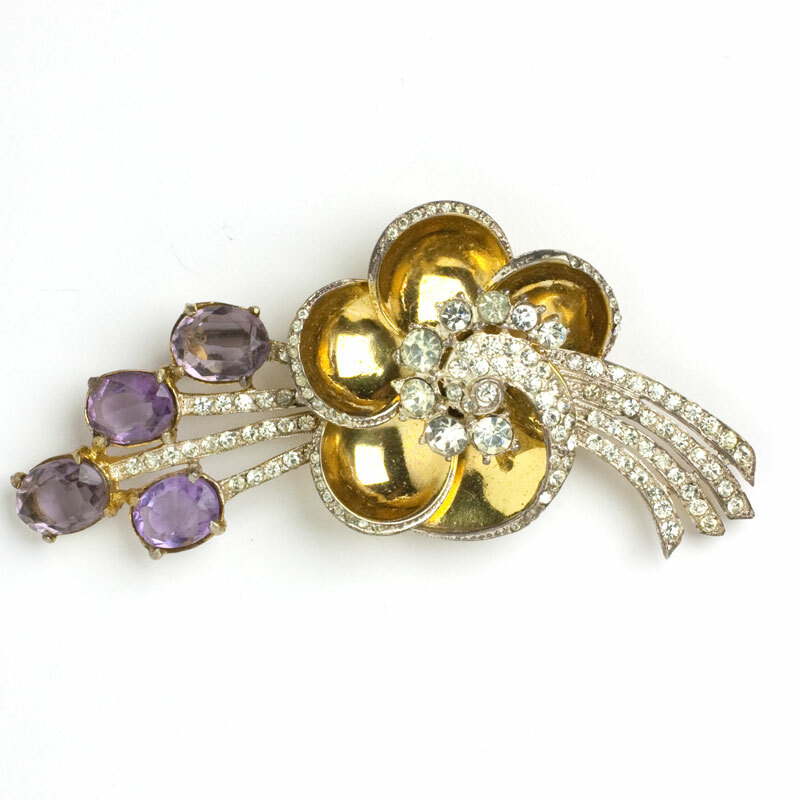 The stem and two leaves are curled a bit to give this brooch a jaunty look. The finish is in great shape. The pin closes with a roll-over safety clasp. Aquamarine & Vermeil Sterling Flower Petal Earrings by Pennino Bros. These lively flower petal earrings with aquamarine-glass-stone centers were made by Pennino Bros. in the 1940s. 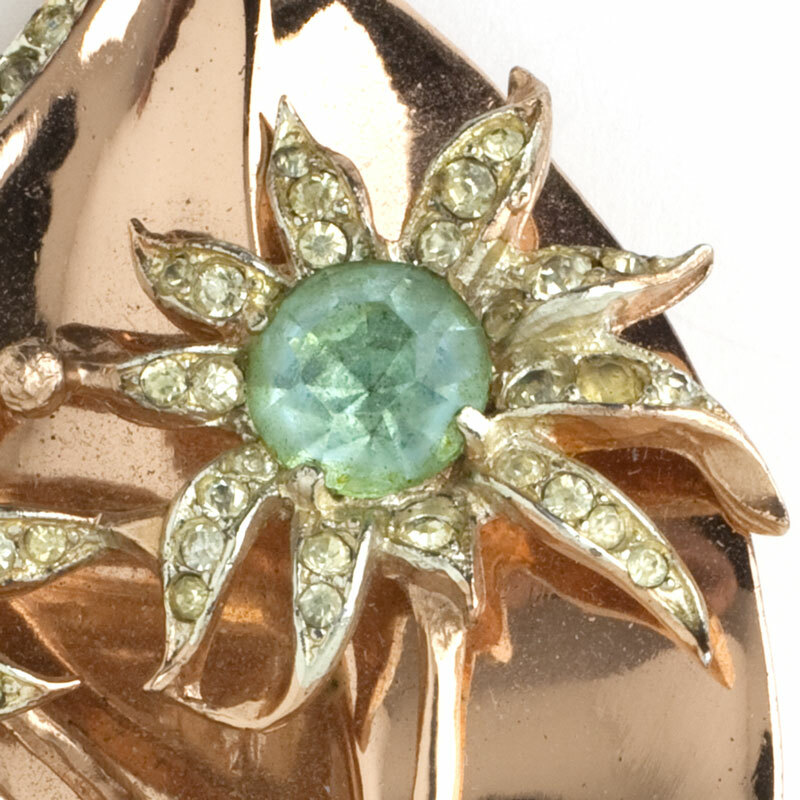 The curled, flirty flower petals in gold-washed sterling silver are the same shape and finish this maker used in a series of 1947 brooches, called Sunburst. The stone settings are the same as their Bulrush brooch and earrings set from the same year. According to Brunialti, the patent pending mark on the earrings refers to the clip mechanism. These designs were not patented. 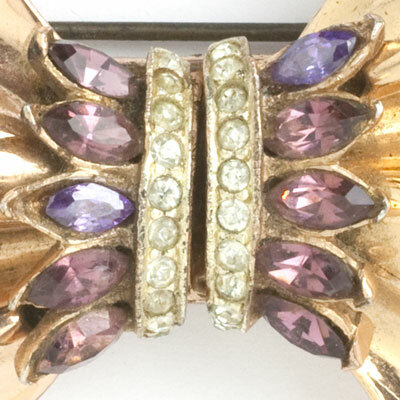 These details are just for background – these ear clips are divine! And by facing each other, they frame your face to perfection. 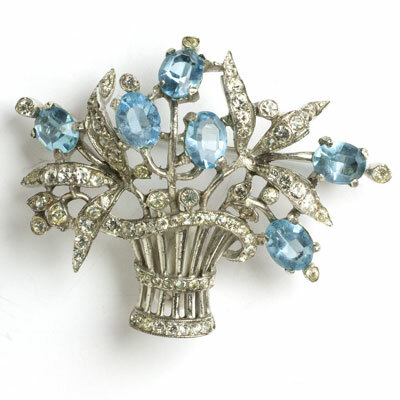 This beaded aquamarine brooch is a 1940s design for Miriam Haskell. 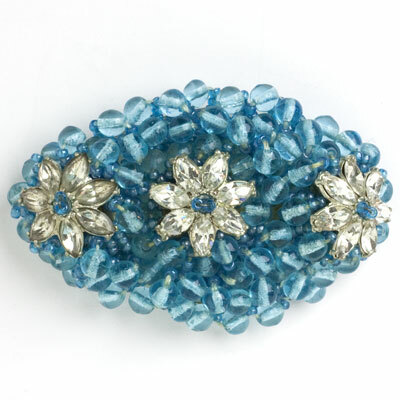 Diamanté navette flower petals sit atop the layers of aquamarine glass beads. They are wired onto a pierced plastic back with a simple C-clasp closure. 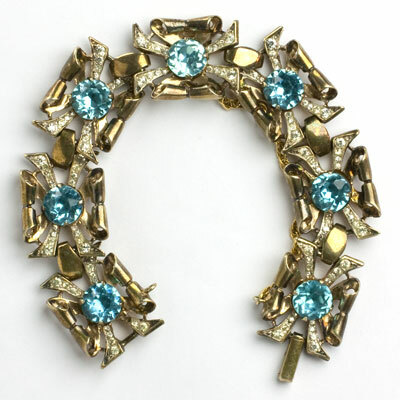 This Frank Hess-designed brooch looks lovely when worn with diamond stud earrings (faux or real) and an aquamarine bracelet like the one below – scroll down to see it. A touch of elegance from a bygone era that’s perfect for day or evening wear. 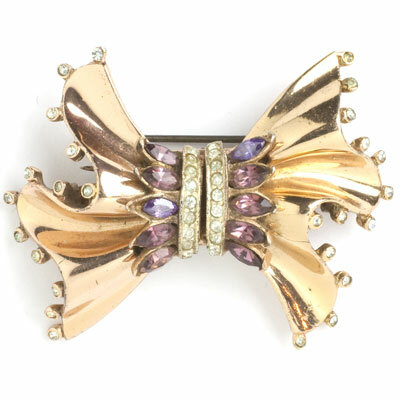 This stunning Coro leaf pin in rose-gold-washed sterling silver has pavé along one curved edge. Layered on top are three stems topped with flowers formed by diamanté leaves and aquamarine-glass-stone centers. This spectacular 1940s piece was designed by Adolph Katz for Coro Craft, the company's high-end line. 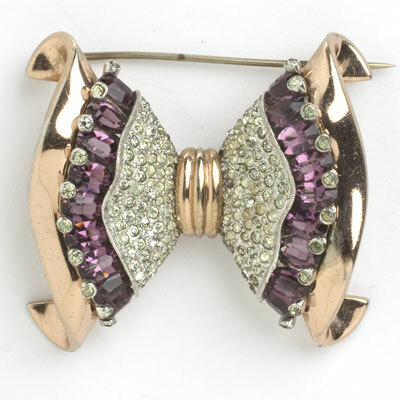 This three-dimensional Retro Modern brooch is in amazing condition, has a roll-over safety clasp, and is perfect for women who look best in warm colors. This piece was part of my personal collection – I am reluctantly offering it to a new home. Note that any color variations in metal are only camera reflections. 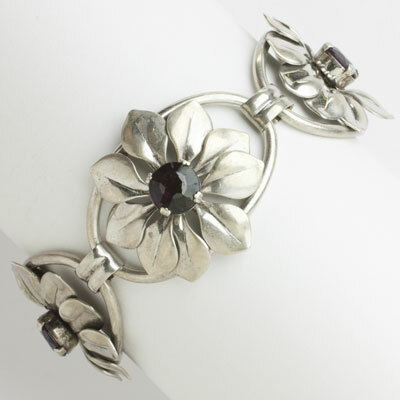 This Coro bracelet was an engagement gift from the former owner’s fiancé in 1945. It had remained in the family until the couple’s son sold it to me. 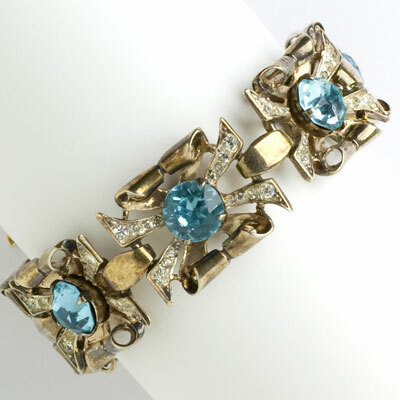 A well-crafted Retro Modern design by Adolph Katz for Coro’s high-end line, it features aquamarine-glass-stone centers and diamanté set in gold-plated sterling silver with a fold-over clasp. The safety chain is a replacement. This piece is another wonderful example of period design and manufacture from one of the best! If you prefer white metal, scroll down to see the same bracelet in all diamanté set in sterling silver. 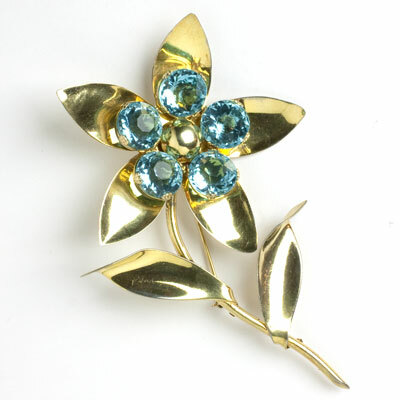 Aquamarine, Diamanté & Vermeil Sterling Flower 1940s Brooch by Mazer Bros. 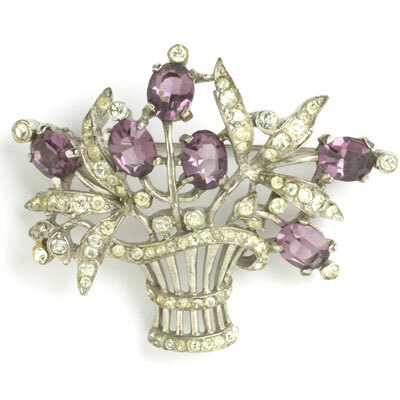 This tall and graceful brooch by Mazer Bros. is a fine example of the Retro Modern style. 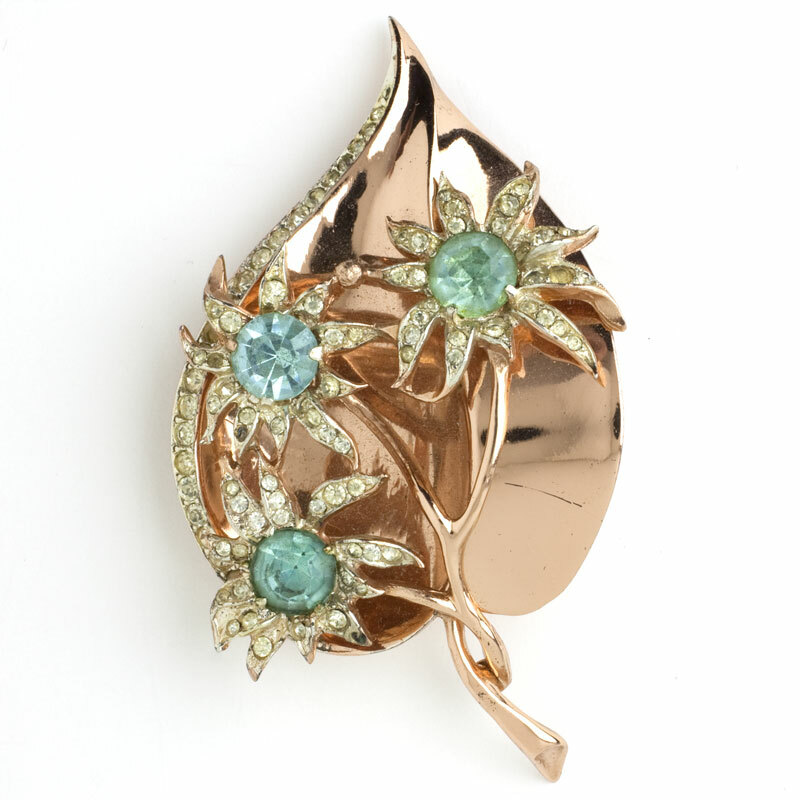 This substantial, stylized flower features a large, faceted cushion-cut aquamarine-glass stone as its focal point. The gold-washed, sterling silver setting is further embellished with four, faceted oval-cut aquamarines along with pavé-accented gold swirls. This pin closes with a roll-over safety clasp. 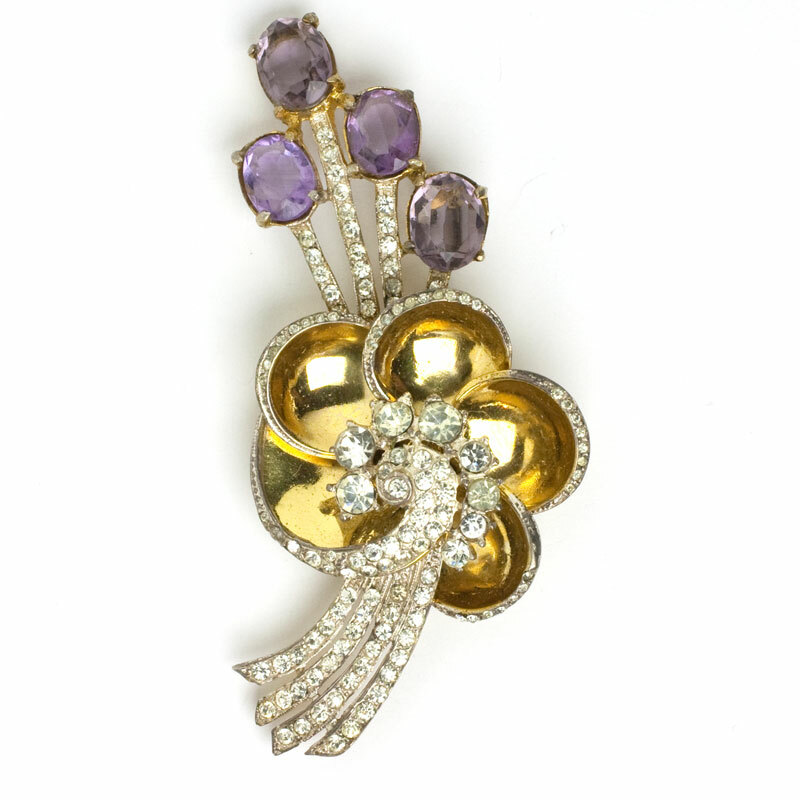 Pieces of this size with a gold-plated finish often don't survive as well as this brooch has. 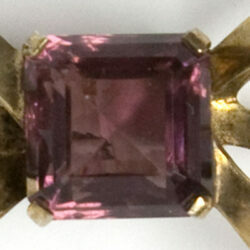 But costume jewelry was well-made in the 1940s by companies of this maker's stature. 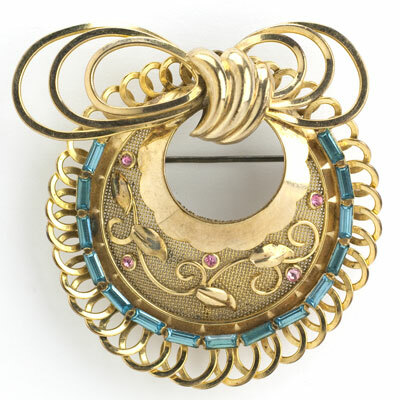 This gold-filled Walter Lampl brooch is formed by a series of rings in different designs. 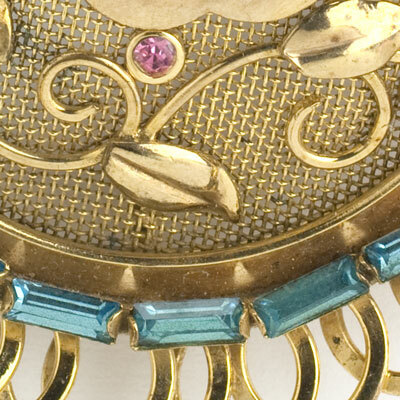 The widest is convex and made of gold-mesh, with an overlay of gold leaves and vines along with tiny pink-topaz-glass stones. 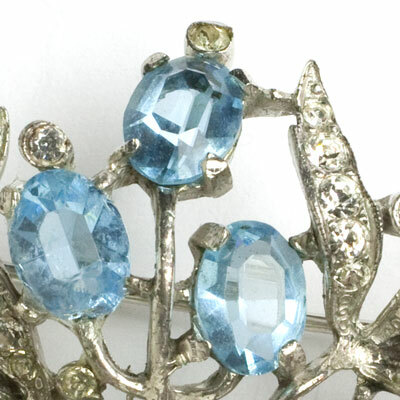 A narrow ring of aquamarine-glass baguettes provides further embellishment. At the top is an elaborate horizontal bow with three loops on each side and in the center. 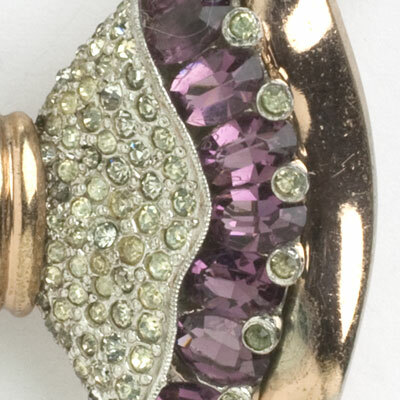 This 1940s jewel has a roll-over safety clasp and a loop at the top and bottom to allow the piece to be worn as a pendant. 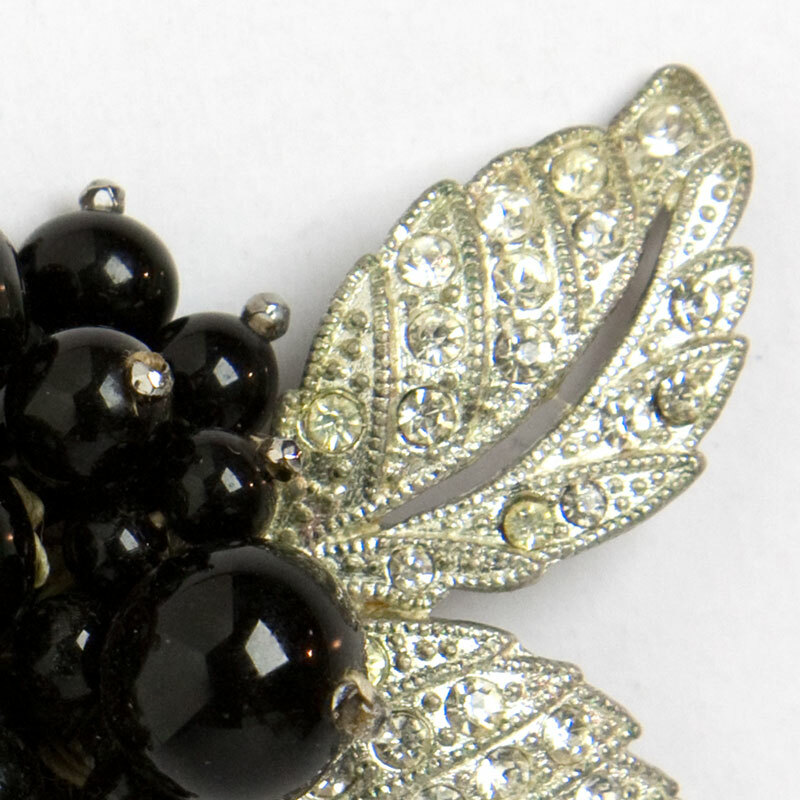 This floral brooch features a cluster of black glass beads sitting atop silver-tone metal leaves paved in diamanté. These elements were wired and sewn by hand onto a pierced metal foundation with edges. The pin closes with a simple C-clasp. Another lovely Frank Hess design from the World War II era. This wood bead brooch is typical of the type of whimsical pieces designed by Frank Hess for Miriam Haskell during World War II. At the top, the coffee-bean-shaped beads form flower petals that surround small round beads with gilt-metal caps. They are all hand-sewn onto a pierced, flat metal foundation. From there, a riot of beads dangle from gilt-metal links attached to three braided-silk cords. 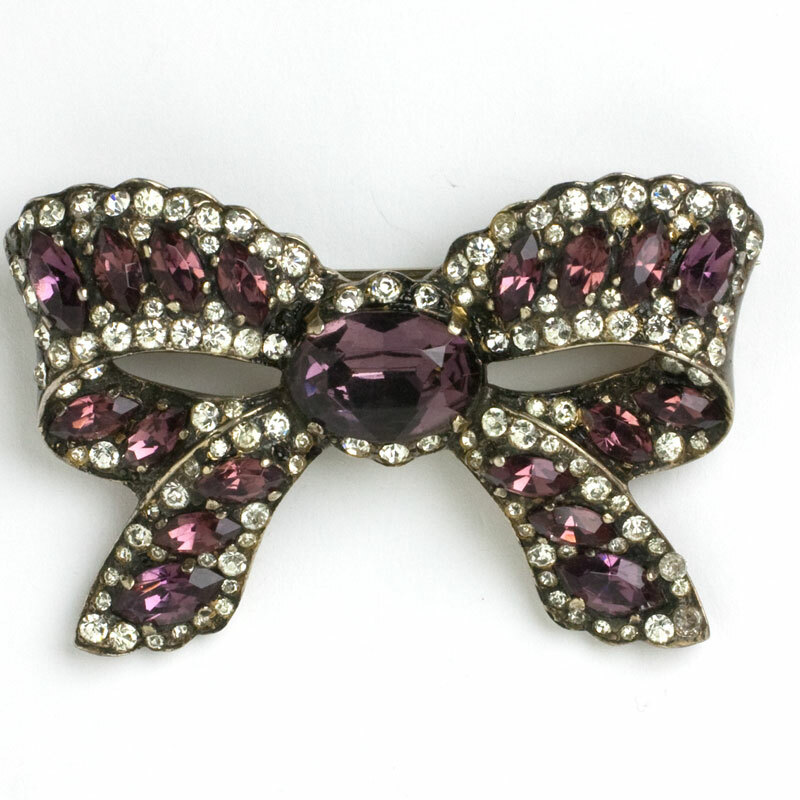 This brooch, which closes with a roll-over safety clasp, is in remarkable condition and fun to wear!